Visualizing the melodious sound of “Arirang,” it identifies a broadcasting organization which would promote Korea to the world in a modern, classic and cultural manner. Applying red, it emphasizes the dynamism and happiness. Considered the essential element of Arirang’s identity, the mark takes a major role in putting to practical use in a medium of communication. 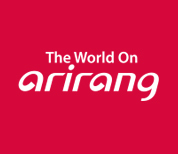 The logotype cannot be altered in any way or separated from its entirety since it represents the official title of Arirang. When combining the official slogan with any forms, the proportions of the signature typography should be used in accordance with the guideline. Corporate typography is used to mark an official signature and a name of attached organization. It must always appear in their fixed relationship, which may not be altered, adjusted or modified in any way.